Nutrient mining through removal by crops, soil erosion and leaching is a major challenge for sustaining the productivity of oilseeds. Besides external application of fertilisers, a major contribution of nitrogen for legumes is addressed by nitrogen-fixing bio-inoculants. In the scenario of climate change, efforts should also be made to identify climate-resilient microbes to address the issue in the future. Within the constraints of available resources, a large number of plant growth-promoting microorganisms including AM fungi have been identified and found to enhance growth and yield of many oilseed crops. However, effective strains tolerant to abiotic stresses like salinity, high temperature and moisture-deficit stress are scanty. The quality inoculum production of AM fungi and its application in oilseeds have been discussed with consideration of the soil edaphic factors for identifying potential AM fungi and their management for higher oilseed crop yields yet maintaining the agroecosystem sustainability. The authors are thankful to the Director of ICAR-Directorate of Soybean Research, Indore, India, for his kind support during the compiling of this task. 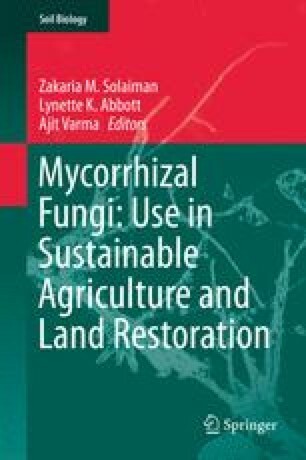 Authors are also thankful to Prof Hamel Chantal, Agriculture and Agri-Food Canada, for making critical comments and suggestions on this review chapter.